3. A dialog box is displayed. Click on Sign in with your organization portal . 4. In the area where you enter your organization's URL, enter unt.edu and click Continue. 5. A dialog box is displayed. Log in using your UNT Enterprise User IDentification, EUID, and password. Click Login. 6. A dialog box is displayed. If you have not had an account before, click No, I've never had an account. Your account then will be created in Lynda.com. 7. If you have had an account, click I've had an account. a. Enter your previous user name and password. Click Transfer my history. A welcome screen will be displayed. 1. Open the Lynda.com application. 2. Touch Already a member? 4. 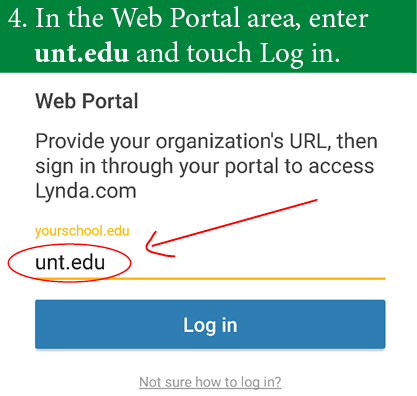 In the area titled Web Portal, enter unt.edu and touch Login. 5. Log in with your UNT Enterprise User IDentification, EUID, and password. 6. Accept the terms and conditions, if prompted.